My boyfriend had been living in Madrid for 5 years whilst I was in London. I was 28 and ready to know if it was meant to be or not. I was doing my Masters in Training and Development and working in HR and Legal but felt that this wasn’t what I was meant to do for the rest of my life. After a few bottles of wine with my girlfriends one night, I made the phone call to tell my boyfriend I was coming to live in Madrid. He responded with a slightly lukewarm response but that may have been due to the fact that I called him at 3 in the morning! 2 months later I arrived and oh my what a shock! What does a girl do in Madrid when she doesn’t speak Spanish? I played house for 2 weeks, cried on the phone to my Mum about why she hadn’t taught me to iron shirts and then did a 4-week Spanish course. 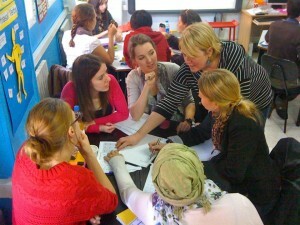 I met another student who had done a TEFL course in Madrid and I thought I would give it ago. Being an English teacher wasn’t exactly a dream but I couldn’t be picky! I loved teaching English from day one. I don’t know where my teaching seed had been hiding but it came out loud and proud during my TEFL course and I knew it was for me. However, kids weren’t really for me, so with my business background I started teaching adult in-company classes, which was really fun. The hardest thing was getting them to concentrate, as being the finance director of a big company isn’t exactly thrilling, so the English class tended to be the fun part of the day. After a year I was asked to head up an in-company program. It took me two weeks to accept—why? Because it was back to the 9-5 routine. I had gotten very used to my mid-morning events (nap, yoga, coffee with friends, reading a book in the park, swimming, etc.) and of course the 4-day week. However, my life in Madrid was going to be fairly permanent, so I was looking for more than a job—I wanted a career in this industry. Around the same time, my TEFL school asked me back to be an observer and I really enjoyed it. So after a year of being an in-house program manager and TEFL trainer, the next step seemed very natural—set up my own TEFL school here in Madrid. I set up TtMadrid in October 2005, and the first 4 years were the most exhausting, nerve-wracking, fun-filled years of my life. Now the business is established, and it has never once felt like work, and I am always looking for new projects. I set up our Spanish school at the beginning of 2013 so back to the exhausting nerve-wracking roller coaster ride—and I am loving it (terrible grammar but we can debate that on the course)! 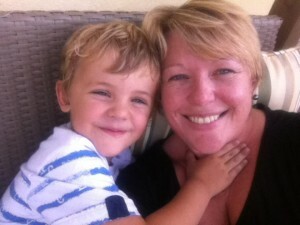 I married the boyfriend in Spain on a cliff top and my little boy Jack was born in 2008 and is growing up bilingually. I still miss family, but they are regular visitors, and I can’t ever imagine going back to the UK. This is home and a very happy home. Let me start by telling you a little about myself. I’m 32 years old and originally from Birmingham in the UK, where I lived and worked for the majority of my pre-TEFL life. I studied history at university before settling into a 9 to 5 career in finance with Barclays Bank. I’d spent five long years there when I decided that there must be more to life than sitting in the same office everyday, and looking out the window at the grey skies and rain. My girlfriend at the time had always wanted to live abroad so we finally decided to take the plunge and see what would happen. So I gave up the stable job, we sold almost all our possessions, packed our bags and set off for Madrid to start our new life, filled with feelings of excitement and trepidation about what the journey was to offer. I’m pleased to say that that girlfriend is now my wife, and that the journey has been full of so many amazing experiences. Right from the very beginning, taking my TEFL course at TtMadrid, where I made so many friends and learned so much, up until now where I’m currently beginning my fourth year teaching English here in Madrid. I’m still enjoying every minute of it and revelling in all the possibilities you have when you combine a TEFL teacher’s timetable and flexibility with the wonderful Spanish way of life. After 4 years in Madrid I now call it home and with no plans to return to England in the near future, I intend to keep it that way. There are so many reasons why Madrid has become home for us—the weather, the food, the drink, the people, the culture, the opportunity to travel, the list is endless! For starters, the weather is absolutely amazing! The sun, the blue skies, the great temperatures all offer so many options, such as going to the park, the pool or the mountains. When you come from a dreary old country like I do, the weather in Spain is enough on its own to make sure you never go back! The Spanish cuisine, as my students tell me ALL the time, is one of the best in the world. It’s something I really can’t argue with, and being the capital city, Madrid has it all, with dishes from all over the country. However the longer you’re here, you’ll discover that there is so much more on offer than just tapas. The cosmopolitan nature of the place means that you can find tastes from around the world to feed whatever craving you may have or to remind you of that special something you may be missing from home. And that’s just the food—don’t even get me started on the wine! From the moment I arrived, I absolutely fell in love with the Madrid nightlife and the social side of the city, nothing I could write could do it justice. Except to say that you could live here for a thousand years and not manage to find every bar, club, restaurant, café or roof top terrace the city has to offer, although I’m sure you’d have a lot of fun trying! While you’re out and about don’t let those surly waiters put you off; once you get to know them, the Spanish are some of the friendliest, most outgoing and generous people I’ve ever met. On so many occasions I’ve been wined, dined or simply taken for breakfast by my students, not to mention the Christmas, birthday and wedding presents I’ve received. 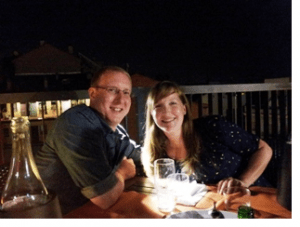 If you’re lucky, like me, many of your students will eventually become friends, which will only help to enhance your Spanish adventure further. The cultural activities, such as museums, galleries, theatre and of course the football are second to none in Madrid. And being so well communicated, Spain, Europe and the world are your oysters when it comes to travel. Of course to appreciate all of these wonderful opportunities, we all, unfortunately, have to work. If you must, then there are a lot of jobs you could be doing that aren’t half as enjoyable, rewarding and continually challenging as being a TEFL teacher. Teaching English in Madrid has thrown me into so many interesting situations, introduced me to so many different people and allowed me to explore the city and discover so many new and fascinating places that, if I was doing an ordinary job, I may never have found. For me no one day is the same, whether it be teaching a company director in the plush surroundings of a modern office development, helping a group of students prepare for an exam in the historic board rooms of the Bank of Spain, going to a business lunch with a doctor and her associates or simply having a conversation class over a coffee in one of Madrid’s thousands of beautiful bars or cafes. Whatever the situation, there is always a rewarding feeling at the end of the class, when you’ve taught your students something new, knowing that you’ve helped them improve themselves. Being a TEFL teacher also offers great flexibility as you can choose your own schedule and work as many or as few hours as you need to, which means that when you want to get away from it all, you can schedule your classes to suit your plans. 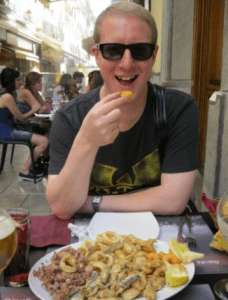 For all of these reasons and so many more besides I can’t recommend enough the experience of moving to Madrid and becoming a TEFL teacher. Although I miss my family and friends of course, I have a lovely apartment in a great area of the city and I’ve made so many new friends from all over the world. Even four years on I still walk around the city with a smile on my face, thinking I can’t believe I made such a huge change in my life and how great it’s turned out. Like I said before, this is now my home, and at the moment I just can’t see me wanting to return to England anytime in the future. The one regret I have? Not coming here years earlier!